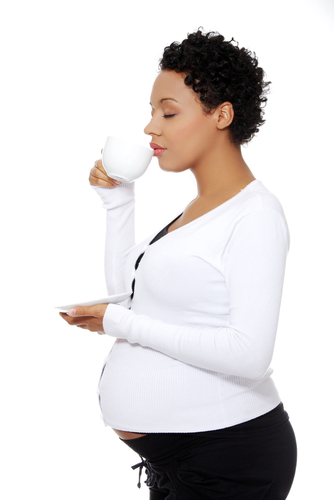 During pregnancy you should limit your daily caffeine intake to under 300 mg. Tea contains caffeine, and depending on which tea you drink, and how much you drink, you can easily exceed the daily recommended dose of 300 mg caffeine/day. The amount of caffeine in tea varies significantly depending on the leafs and the tea preparation method. Black tea averages 50-90 mg per 8-oz. cup, green tea contains somewhat less, and white tea contains the lowest amount of caffeine. On average, tea leaves contain 3% caffeine by weight, although this can range from 1.4% to 4.5%. Many factors determine the caffeine content in the dry leaf, such as soil chemistry, altitude, type of tea plant, position of the leaf on the tea bush and cultivation practices. For example, the young bud and first leaf generally have slightly more caffeine than leaves picked from the lower part of the tea bush. The leaves from the small leaf China tea plant (camellia sinensis) tend to have lower caffeine levels than the leaves from the large leaf Assam tea plant (camellia assamica). One factor that does not impact caffeine level is the level of oxidation. Green, oolong, black and white teas all contain caffeine. No one category of tea has more or less caffeine than another. Again, it all depends on the particular tea in question. There are many parameters in tea preparation that affect caffeine content such as the amount of leaf, the leaf particle size, water temperature and steeping time. For example, tea steeped in hot water for a longer time will release more of its caffeine than tea steeped with cooler water for a shorter period. A smaller leaf tea will release more of its caffeine than a larger leaf tea. Add water to the leaves and brew for the amount of time that is appropriate for that particular tea. One study looked at the amount of caffeine in different tea preparations (Astill et al: J Agric Food Chem. 2001 Nov;49(11):5340-7). They concluded that the variety, growing environment, manufacturing conditions, and grade (particle size) of the tea leaves each influence the tea leaf and final infusion compositions. In addition, the composition of the tea infusion was shown to be influenced by whether the tea was contained in a teabag and, if so, the size and material of construction of the bag. Finally, the preparation method, including the amounts of tea and water used, infusion time, and amount of agitation, was shown to be a major determinant of the component concentrations of tea beverages as consumed.